Dubai: Property stocks saw active buying interest on the Dubai Financial Market (DFM) on Monday after reports of new real estate regulations that are expected to encourage the inflow of foreign funds into the sector. Emaar Properties jumped 1.68 per cent to Dh4.24, while Damac Properties rose 5.79 per cent to Dh1.28 by the end of the trading session on the Dubai Financial Market (DFM). 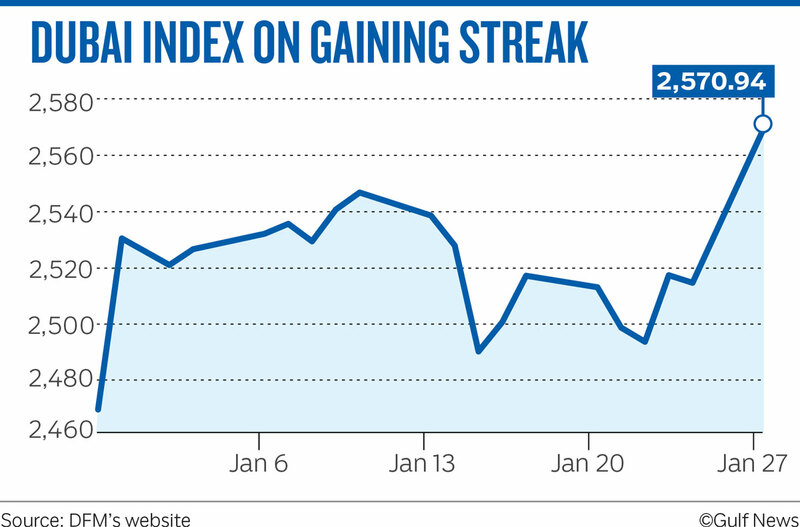 The DFM general index ended the day in positive territory, closing 1.23 per cent higher at 2,570.94. Traded value weighed in at Dh241 million, up from the previous session. The index has now close in the black in three out of the last four sessions. “The government is very keen to encourage foreign investor in the real estate sector. Dubai is working on new laws that could encourage more investments that would stabilise the oversupply,” Tariq Qaqish, managing director for Asset Management at Menacorp, said. Investors are looking for some permanent trends to restore their trust, and speculation, while good fuel for volumes, can have a negative impact on investors and the desired recovery. Arabic newspaper Al Khaleej reported that the Dubai government may issue four new laws — on joint ownership, rents, real estate investment and mortgages — that will complement the current legal regime. Arabtec headed lower, falling 0.93 per cent lower to Dh2.14 and joined by Aramex which slipped 0.5 per cent to Dh4.10. Generally, trade volumes on the bourse have been subdued — weighed lower by a lack of confidence on the part of investors. The Abu Dhabi Securities Exchange (ADX) general index also ended in the black after active interest in banks, closing 0.61 per cent higher at 5,051.07. “At the moment volumes are still quite low and one could possibly argue that the noise in Abu Dhabi over the potential three-way merger of ADCB, UNB and Al Hilal is more attractive,” Issam Kassabieh, a senior Menacorp financial analyst, said. First Abu Dhabi Bank put on 1.09 per cent to close at Dh14.88 while the etisalat Group was up 0.83 per cent at Dh16.98. Elsewhere in the region, Saudi Arabia’s Tadawul All Share Index ended the day 1.35 per cent higher at 8,623.93 while the Qatar Exchange index was up 0.34 per cent at 10,704.73. The Muscat MSN 30 index eased lower by 0.15 per cent to close at 4,159.94. “Investors are looking for some permanent trends to restore their trust and speculation, while good fuel for volumes can have a negative impact on investors and the desired recovery. With more results coming through and talks of dividends increasing, investors are expected to target high yields and significantly undervalued equities,” Kassabieh said. The Dubai index has been one of the biggest losers in the region, shedding about 22.3 per cent over the last year.